Small businesses often find themselves in the position of having a wide variety of IT equipment. Few have an IT Strategy, with all the advantages that this offers, and businesses are often unsure as to how to put together an IT refresh plan. 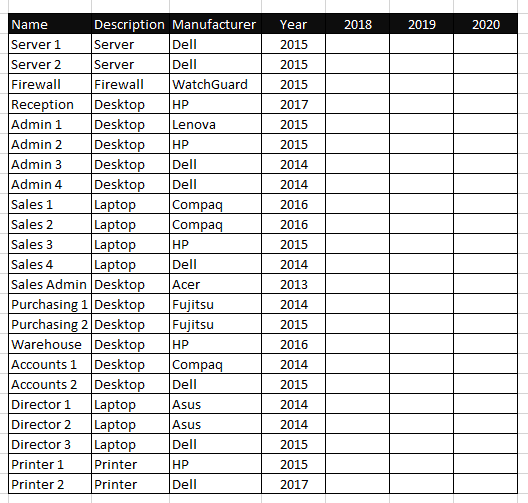 What’s An IT Refresh Plan? That’s a good question. Put simply this is a document that is included in the wider IT strategy. It concentrates on the IT infrastructure, PC’s, laptops, printers etc. and sets out when these need to be replaced. It purely concentrates on the age of equipment. There may be other reasons that equipment needs upgrading or changing put the IT refresh plan means you have a basic idea of when things are coming to end of life and will need replacing. It’s far better to plan replacement rather than waiting for something to breakdown before replacing it. You’ll reduce any downtime to zero. Systems will work more efficiently – computers get slower as they age. You’ll also be able to plan your budgets and, knowing that purchases are imminent, you may be able to take advantage of special offers. Having an IT refresh plan in place also helps with standardisation. It makes sense to standardise your equipment and PC configuration. This removes compatibility and communication problems, improves security and enables scheduling of updates. When businesses start they’ll buy what they need at the time. There may be some thought given but this is likely to be limited to whether to choose PC or Mac. New businesses tend to ‘bootstrap’, looking for the best deal to do what they need at the time. The IT systems grow over time as the business grows. New infrastructure tends to be added on an ad-hoc basis. There is little to no planning or thought as to what the business might need going forward. Then the original equipment starts to get old and new stuff is bought. You end up with a mishmash which can involve machines from several different manufacturers. You might well end up with several operating systems. Machine specifications can vary wildly, and this can cause issues with software. This can include getting to the point where your software simply doesn’t work. First undertake an audit. You need to know what you’ve already got and how old it is. Depending on how old your equipment is this might not be as easy as it sounds. Purchasing records are an obviously a good place to start, but you can also try manufacturers websites using the serial number. Looking at the age of the BIOS can also give an indication of the age of the machine. Just click the Windows Start Button and search for ‘System Information’ click and you’ll see a screen like the one below. This is not the most accurate method as BIOS can be updated but you’ll get a rough idea. A previous blog – Is It Time To Replace Your IT Equipment? – Explains the benefits of replacing and provides a rough guide as to the anticipated useful life of different types of IT equipment. As a rule of thumb you should replace anything over 5 years old as a matter of urgency. You also need to make sure you’re including other equipment in the audit. Servers should not be more than 5 years old. Firewalls that are over 3 years old – especially if they’re not managed – won’t be providing you with the protection you need. Don’t forget switches, printers, plotters, scanners etc. Technology moves on quickly and you might be missing out on newer features. These could offer real business benefits. Once you’ve got the ages of your existing equipment you can start to put together your IT Refresh plan. 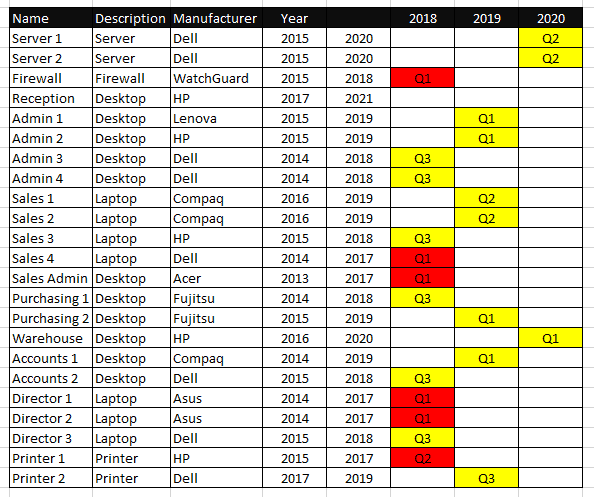 Below is a really simple example of an audit showing the ages of the equipment in a business. 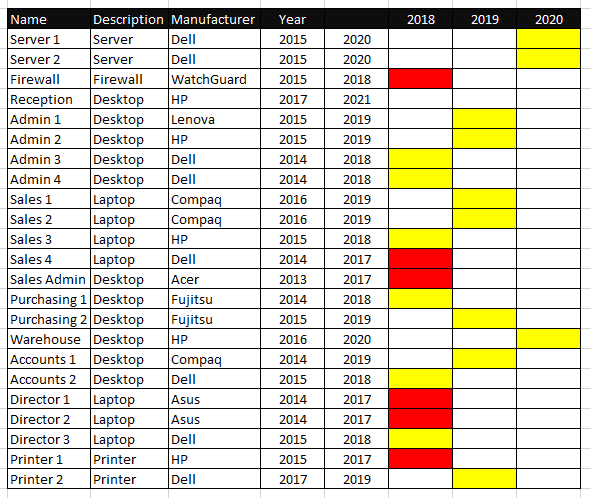 Here we’ve added the refresh dates, highlighted the critical replacements (in red) and the years that other equipment needs replacing. In the next image we’ve involved the finance department and included the quarters when the purchases are going to be made. We can see that the critical desktops and laptops will be replaced first. The critical printer is next and then the rest of the equipment due that year. The business then incurs no spend in quarter 4 before starting again in Quarter 1 of the next year. In 2019 they’ve spread out the spend to aid cash flow. It’s worth pointing out this is just PART of a wider IT strategy. This about replacing what’s already used in the business. You’ll be looking to grow the business so additional equipment may be required. Servers will require full specification etc. This is certainly a very simple example. 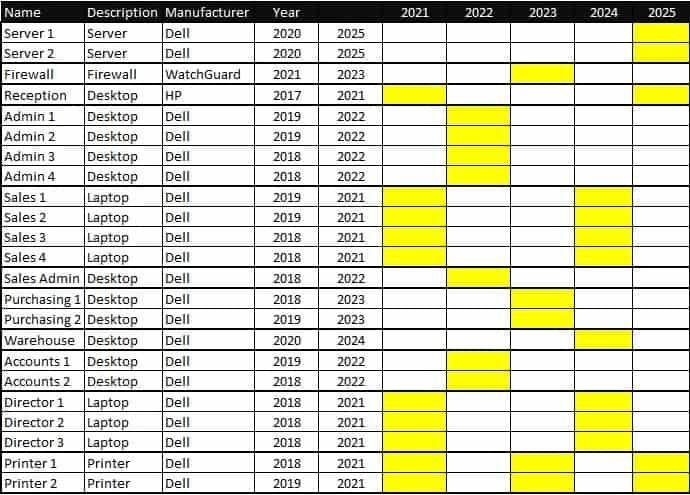 You can see that the company has achieved standardisation, with Dell equipment across the board, and the finance department knows exactly when the equipment needs replacing. As the business grows then additional machines can be added to the plan. If you’re not currently a Your IT client we’ll carry out the basic audit free of charge. Should you subsequently take out a fully managed IT Support contract your IT Roadmap will be produced as part of the contract, this will be reviewed at least once every 6 months by a technician NOT a salesman! Please complete the online contact form, or call us on 0115 8220200 and select option 2. If you are an existing client of Your IT we’ll be talking to you about your IT Roadmap over the coming months. If there is an urgent need please contact your Account Manager, complete the contact form or call us on 0115 8220200 – selecting option 2.